Indian Prime Minister Narendra Modi’s tour across the Indian Ocean this month was long overdue. Despite its name, the Indian Ocean has not firmly been under India’s custodianship, despite New Delhi’s status as the most capable sea-faring state in the region. During his trip, Modi visited Sri Lanka, Seychelles, and Mauritius — Maldives was struck from his original itinerary after the government there jailed an opposition leader — and addressed defense and security cooperation in each capital. In concrete terms, Modi’s visit highlighted India’s continuing interest in deploying and maintaining a network of coastal surveillance radars across the region, leading to heightened intelligence, surveillance, and reconnaissance (ISR) capabilities and maritime domain awareness for the Indian Navy and Coast Guard. The high point for India’s planned CSR network came during Modi’s one-day visit to Seychelles, where he publicly launched (and posed with) the first of a planned 32 CSR stations in the Indian Ocean. 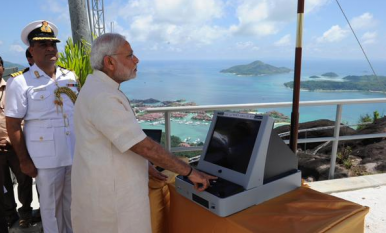 On March 11, Modi tweeted that he had “Unveiled the Plaque and Operationalization of Radar for the CSRS India-Seychelles Cooperation Project,” with an accompanying picture of him attentively operating a radar monitor. The public nature of the CSR deployment highlights India’s eagerness to signal its enduring security interest in the Indian Ocean. The radar deployment in Seychelles comes as China heightens its naval operations in the eastern Indian Ocean. Last year, Indian strategists grew particularly concerned with a Chinese submarine was spotted docking at a port in Colombo, Sri Lanka. China has additionally announced its intention to invest in port facilities in and around the Indian Ocean. The CSR network shouldn’t primarily be read as an Indian project borne of anxiety about China’s forays into the Indian Ocean. With sea-based terror and piracy on the rise in the Indian Ocean, it is not surprising that India would be eager to bolster its maritime ISR capabilities. In fact, the original purpose of the CSR initiative is to allow the Indian Navy and Coast Guard heightened maritime domain awareness to prevent incidents like the 2008 Mumbai terror attacks. Pakistan-based terrorists exploited Indian authorities’ poor coastal awareness and control to infiltrate the Maharashtra coast. Additionally, as recent controversy highlighted, Indian perceptions of coastal terror threats continue to endure. Beyond terrorism, Indian Defense Minister Manohar Parrikar noted last week that, according to Indian estimates, pirates based off the coast of Somalia were shifting their operations into Indian Ocean sea lanes, approaching the Indian Coast. An India-backed CSR network will help New Delhi ensure that the Indian Ocean is not a misnomer and allow India to protect its national security interests. Modi’s trip added momentum to an emerging network of maritime security cooperation between New Delhi, Colombo, Victoria, and Port Louis (with Male’s eventual inclusion if and when the current political crisis is resolved to New Delhi’s satisfaction). If India continues to play its cards right, it could seal its position as the most significant net provider of security in the waters of the Indian Ocean between the Tropics of Cancer and Capricorn. CSRs are just a small part of this endeavor.